Belfast, Northern Ireland, 1971. When a young British soldier is separated from his squad, the race is on from both friend and foe to find him first. Tense? Beyond belief! 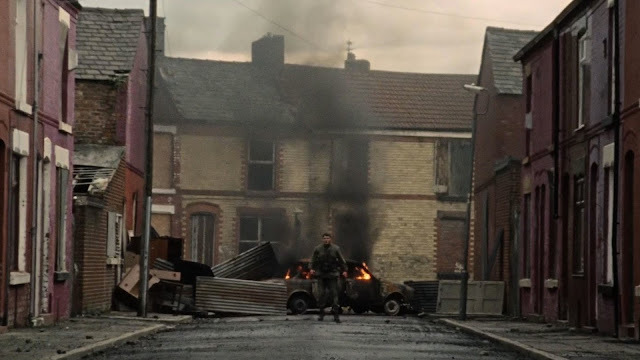 '71 feels less like a recreation than a ringside seat into the hell on earth that Belfast might have resembled to many during this violent era that captured the worlds headlines in no uncertain fashion. Jack O'Connell is fantastic in a near wordless performance that conveys his abject fear and rising confusion about exactly who he can or cannot trust on this increasingly nightmarish evening. This movie is brilliantly executed, flawlessly portraying the ultra-turbulent period with a visceral rawness that is heartpoundingly real, intoxicating all your senses as you, like soldier Hook, realise that the imminent danger lurking on these dangerous streets is not a bad dream, but a hell you must negotiate as quickly as possible if you want to live longer than this very bad and very long night. Quite easily, '71 is one of the finest thrillers I've watched in a very long time, and this is down to one key element. It feels absolutely real.